Our lowest priced Dye Sublimation printer !!!! The compact DrafStation RJ900XG 42" is ideal for everyday Dye Sublimation printing. The printer is fit for both start up and established busiensses wanting to extend their product portfolio. The Mutoh Drafstation RJ-900XG is very easy to operate and maintain. With its competitive price tag the RJ-900XG consistently delivers quality for long and short production runs, and uitilises a unique torque controlled take up system. The Mutoh RJ900XG Drafstation features a variable droplet printhead with 8 rows of 180 nozzles. Allowing resolutions of between 360 x 360 dpi and 1440 x 1440 dpi. 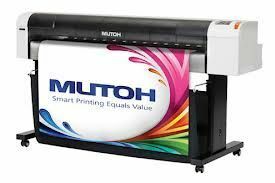 Mutoh's Drafstation RJ900XG Prints on typical 95 to 100gsm dye sublimation transfer papers, making transfer on a wide range of flexible and rigid polyester materials possible. Contact us today to speak to one of our team for competitive pricing or a demonstration !!!!!!!!!!! !